In a new study published April 23 in the journal Nature Physics, Yale researchers "pitch" a qubit—a tiny bit of quantum data—from one physical point in a microwave cavity to a separate point in a different cavity. It is the first time an end-to-end quantum transmission has been done on demand and represents the first of two Yale experiments involving "pitch-and-catch" technologies that will be published this year. Quantum computing offers the possibility of computation speeds that are orders of magnitude faster than today's supercomputers. Yale researchers are at the forefront of efforts to develop the first fully useful quantum computers, and have done pioneering work in quantum computing with superconducting circuits. But in order for a quantum computer to run more complex algorithms, it will need more processing power, just as a classical computer does. To do that, qubits must be interfaced with each other—which is why a "pitch and catch" capability would come in handy. "Our approach is to use a quantum network to connect many qubits together in independent modules," said Christopher Axline, a Yale graduate student and co-lead author of the new study. "The strategy is similar to clustering computers together on a local area network." Axline works in the Yale lab of Robert Schoelkopf, the study's principal investigator. The other co-lead authors of the study are Yale graduate student Luke Burkhart and former Yale postdoctoral associate Wolfgang Pfaff, who is now at Microsoft. Previous work by the researchers enabled them to pitch a qubit, while preserving its information. Now they're able to catch the information, as well. "You might think catching our flying qubit would be a straightforward extension of our other work, but it actually requires some careful treatment," Burkhart said. "It meant varying how quickly, and at what frequency, the information is released. If we open the floodgates and let energy flow out as quickly as possible, it will overwhelm the catcher." Another first for the experiment is the use of the cavities—in addition to the qubit itself—as the memory for the system. "Much of the research in our lab and at the Yale Quantum Institute focuses on how to take advantage of cavity modes for quantum information processing," Axline said. "Superconducting cavities are the most secure places we can store quantum information, and even more important, cavities are flexible as to the form of the stored information." 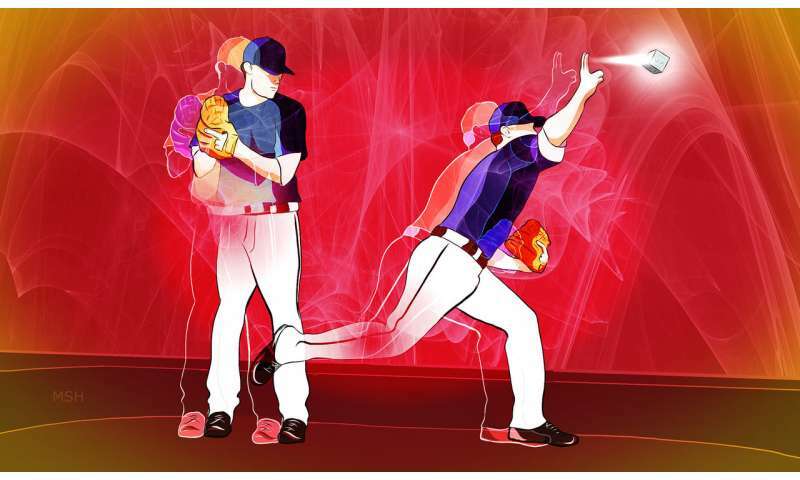 "We entangle the states between the pitcher and the catcher," Burkhart said. "This remote entanglement will be crucial in quantum networks."